I just got SMURFed the other day. I enjoyed another serving of the cute blue fellas in the big screen. I am truly amazed on how effective Sony Animations makes 3D movies and its incorporation with our real world. If only I can have my own Smurf Village filled with cute Smurf in our back yard (smiles). 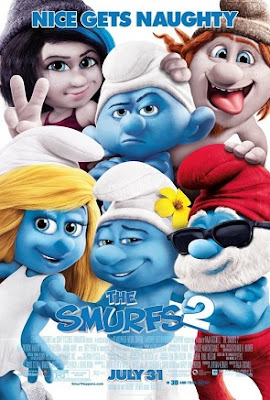 SMURFS 2 returns the pint-sized blue heroes back to the big screen. The evil wizard Gargamel creates a couple of mischievous Smurf-like creatures called the Naughties that he hopes will let him harness the all-powerful, magical Smurf-essence. But when he discovers that only a real Smurf can give him what he wants, and only a secret spell that Smurfette knows can turn the Naughties into real Smurfs, Gargamel kidnaps Smurfette and brings her to Paris, where he has been winning the adoration of millions as the world's greatest sorcerer. It’s up to Papa Smurf, Clumsy, Grouchy, Vanity, and the Winslows to rescue her! They journey to Paris and ride an adventure around the city trying to get Smurfette back. In the end, they all learn the meaning of love and family. This is one of my most favorite animated movies of this year, to date. I have enjoyed watching these cute blue creatures since I was a kid. The simplicity of the story and twists that aims to teach kids lessons are just a few reasons to watch the film with your family. My favorite Smurf for this movie is Vanity Smurf (I had just giggled after remembering his cute antics). It is a Smurfy-smurf smurf movie! SMURFS 2 is well made with some impressive animation, sound, vocal talent, and story-line. It’s entertaining for children as well as adults. Even better, the movie has a strong moral worldview that says moral virtues are the true magic of life, virtues such as sacrifice, love, protecting life, family, and adoption. Parents should be cautioned, however, about some light animated slapstick violence, some implied language, and the movie’s confused definition of magic. In the end, the true magical elements of SMURFS 2 are the moral values the Smurfs represent. Ultimately, it’s love that makes a Smurf true blue.